Guernsey's Miles Munro has admitted he does not know what to expect as he bids to win a place on Great Britain's 4x100m relay team at the Rio Olympics. The 19-year-old is ranked sixth in the event nationally, with freestyle heats taking place on Thursday. "It's an impossible one to predict," Munro told BBC Radio Guernsey. "I'm confident but you really don't know who's going to pull it out of the bag on the day - it is very much who rises to the occasion." Munro lowered his personal best by more than a second in 2015. 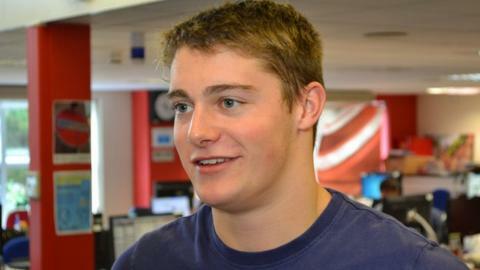 He will also compete in the 50m freestyle in Glasgow on Saturday, but his main focus is the 100m event. "The 100m freestyle is the event where I stand the highest chance, and potentially they'll take up to six (for the relay) if the qualifying times are met," added Munro. "The 50m is a bit more of an outside shot. "It's going to be incredibly tough. I think it's literally a 50/50 chance - I can't call it but I am also very hopeful. "I'm incredibly young and you come into your prime as a swimmer in your mid-20s, so I'm just going to really enjoy it and hope something good comes out of it."